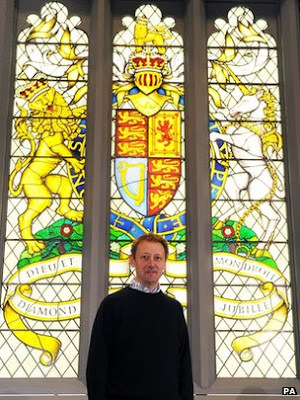 Heraldry: Heraldic Stained Glass in the News! Politically Correct Heraldry in the News! Heraldic Stained Glass in the News! There’s a recent (March 20, 2012) article over on “the Beeb”, BBC.com, about the new stained glass window recently unveiled at Westminster in honor of Queen Elizabeth II’s Diamond Jubilee, and the artist who created it. As you can see, it’s a marvelous piece of heraldic art. It is made up of about 1,500 individual pieces of glass, and is a gift to the Queen paid for by personal contributions from members of both houses of Parliament. It will be installed over the north door of Westminster Hall later this year.